I’m just going to warn you, next week’s Sew Our Stash post really runs the risk of being filled with 50 of these Casual Lady maternity-ized shirts. I’m just a tiny bit in love with this Go To Patterns top. Even with a few minor alterations to make it “getting fat” friendly this thing came together in less than an hour and that includes the cutting time. First, if you sew or might some day want to learn to sew I highly highly recommend this shirt pattern. It’s fast, flattering, and fits great. 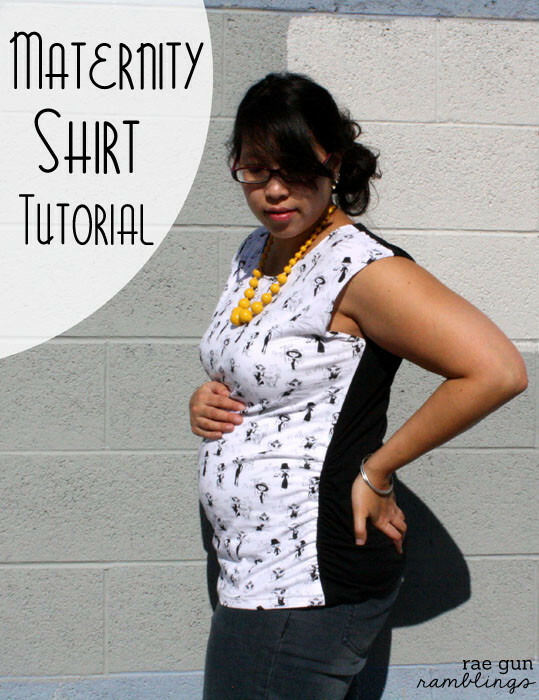 Second I’m going to show you a quick and easy maternity shirt tutorial but how about a little more random pregnant girl counting before that? Third, I went to the mall today to try and find some maternity clothes and boy were the options BORING and expensive. I mean seriously I am so glad that I know how to sew or else I’d be really depressed right now. Fourth, I may have purchased this awesome Parisian Kitty fabric back when little L was just in my sister’s tummy. She recently turned ahem 5. Yeah I’m kind of a fabric hoarder and it just takes me a minute to figure out what I want to do with it. I still have a wee little onesie cut out somewhere around here obviously it won’t fit L any more. Fifth, for those of you who care about the whole prego thingy. Here are a few updates. I’m 21 weeks. I can definitely feel some baby kicking action. It’s weird and startling. I still hate water. I feel huge and I’m only half way oh my goodness! Last week I started to feel like my body was just weird. Moving is more awkward. I actually have to put effort into changing positions. Have I mentioned it’s all weird? The gender reveal will be the end of next week. We’ve been trying to talk about names nothing too promising, we still have very different tastes. No cravings but I go from not hungry to totally starving in seconds. Sixth, I’m a bit in love with the two tone shirt thing. I see many more in my future. The Casual Lady shirt pattern comes in both a top and a dress length and it’s really very easy to tweak to make it prego friendly. The way I did it can just as easily be applied to other shirt patterns or even longer store bought shirts. 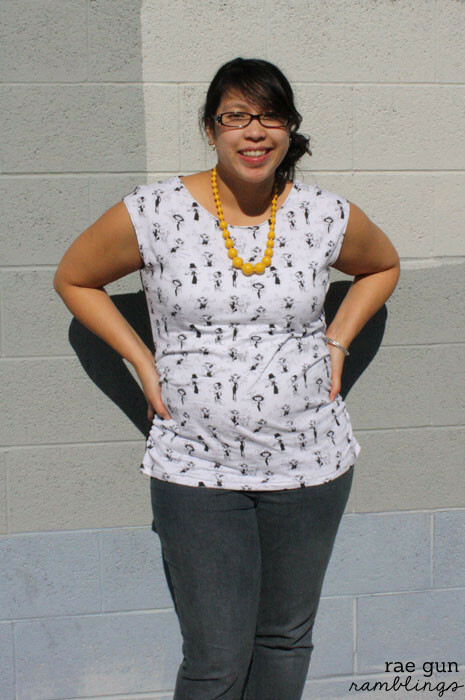 On the Casual Lady pattern there is a line to lengthen or shorten the pattern. I added 6 inches. If you’re using a different pattern you’d probably want to lengthen around your natural waist (skinniest part). If you’re starting with a ready made top skip down to step 3. Follow the pattern’s instructions so you have a finished top. Now try on your shirt and with a disappearing marker mark the side seam around the top of your belly or about the bottom of your ribcage. Lay the shirt inside out and mark the same spot on the other side. I just mark one side in step 3 since I want the ruching to be even. Cut two pieces of 1/4 inch elastic 9 inches long. The part of the of shirt that I attached it to was about 13 inches. I normally wear M to L shirts if that helps. On the inside of the shirt position your elastic one one side of the seam. I decided to do the back since the stitching would be less obvious on the black. I think either side would work. Make sure your seam allowance is out of your way. With a zig zag stitch sew down the elastic WHILE STRETCHING it. You want it stretched to right above the hem of the shirt making sure to back stitch at the beginning and the end. So there you go. 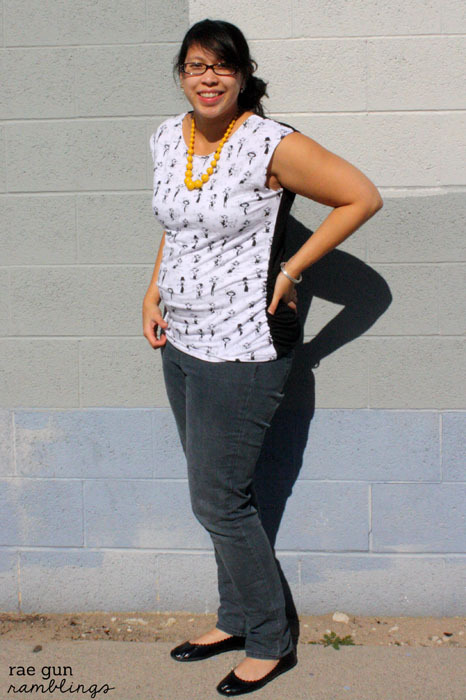 How to maternity-ize your Casual Lady pattern. Go To Patterns is running a sale all week long now too if you’re interested. Use the code KCW10 to get 10% off your order. Or spend $30 and use code KCW20 to get 20% off your order. To see more versions of the Casual Lady top check out The Train to Crazy and visit the Go To Patterns Shop. Marissa!! I’m so excited for you and that little bean. I hated shopping for maternity clothes but I did find a couple good pairs of pants, some elastic waist skirts and a few basic tees that I dressed up and made fun with accessories or things that didn’t need to fit so well. It got me through two preggos without buying much maternity! Good luck. And you are very lucky to be able to sew your own stuff! Love the shirt Marissa – so excited for you!!! Congrats! Being pregnant IS so weird. Love the kitty top, especially the two-tones! 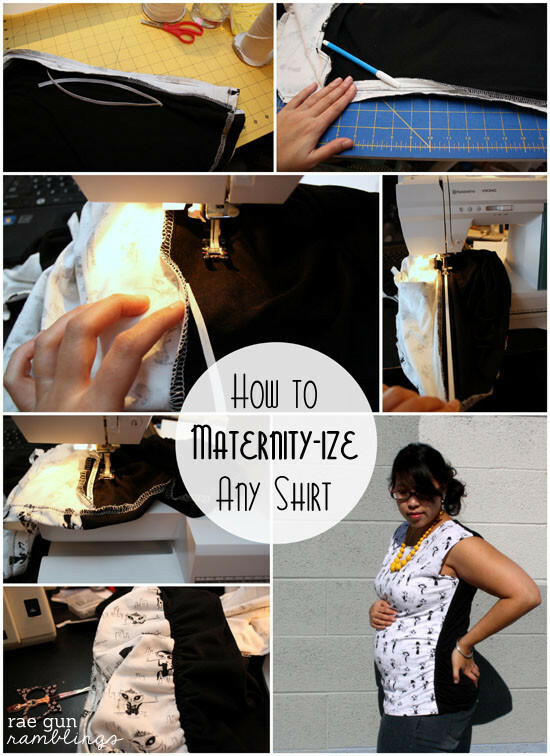 I’ve done this trick to maternity-ize shirts too! They still look good post-maternity as well :) I didn’t sew my own shirts for this, but rather bought Tall sizes of shirts online (if the store you like doesn’t offer tall sizes in shirts, tunics work too). When my belly got REALLY huge, I bought tall sizes in men’s shirts (their tall sizing is almost always longer than in women’s sizing, and I needed the extra length). Using this trick on a men’s shirt makes the fit instantly more feminine without any other alterations, which is also handy! Now I wear those extra long shirts with leggings or skinny jeans and they’re still flattering and comfy (and camouflage what’s left of my post-baby belly)! So this is a trick that you’ll still be able to use in your wardrobe after you start packing up some of the other maternity wear options, and I super love that. Thank you for posting this alteration trick!! You’re adorable – and I love easy tutorials. No, I’m not expecting, but I love comfy stretchy shirts!!! 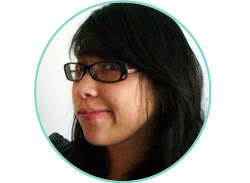 This is soooo darling Marissa! I love it! That fabric is so perfect and you look adorable! Hey there, mama! You’re looking beautiful. So is that precious little pumpkin! Awwww, could you be any cuter!! And seriously knock yourself out in those maternity shirts…how perfect is that!! I’m going to have to try this pattern for sure! Its super flattering and you look darling with your little bump! So, so cute!! You are so talented!! Wish I could have tried this during my pregnancy days. :) So cute. You are just the cutest pregnant woman ever. No lie. PS, I love the material your chose for this shirt! I love how you made this a half and half shirt. It looks amazing on you! !